Nearly 30 minutes after Walpole thought they had made Super Eight history, the Rebels finally put it in the book. 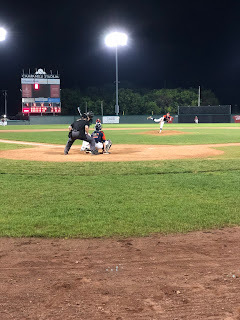 After seeing Mansfield rally for five two-out runs in the bottom of the ninth off of starter Matt Donato, Walpole answered with three runs of their own in the top of the tenth highlighted by a Tyler Page go-ahead RBI double. In bottom half of the frame, Rebels’ reliever Matt Chamoun worked around a one out error to close it out as Walpole defeated Mansfield in 10 innings, 10-7, in an elimination on Friday night at Campanelli Stadium. Walpole advances to play the loser of Saturday’s quarterfinal matchup between St. John’s Prep and Franklin. Mansfield finishes its season at 19-5. Ahead 7-2 after eight and seemingly well in control, Costello sent Donato back out to the mound to finish the complete game with 106 pitches to his name. Donato set down the first two hitters with relative ease, inducing a fly ball to center before getting a strikeout. Christopher Jenkins kept Mansfield alive with a single to center and moments later Michael Hargadon launched a two run shot to left to pull the Hornets within 7-4. With the bases now clear, Sam Nugent and Dan Saraceno kept the line moving with consecutive singles bringing Kevin Dow to the plate as the tying run. Donato got ahead of Dow 0-2, but on the two-strike offering the Hornets’ three hitter sliced a single into left field that got by the outfielders and rolled to the track bringing home Nugent and Saraceno to trim the deficit to 7-6. Two batters later, Justin Pena tied it up grounding a single back through the box that brought home Dow and evened things up at seven. Mansfield had a chance to win the game with runners on the corners and two men down, but the Rebels’ catcher in Page blocked a curveball in the dirt that saved the game-winning run from crossing the plate and Donato induced a fly ball to right field to send the game to extra innings. In the top of the tenth, Hornets’ reliever John Carney got a pair of outs around a walk, but Page lined an RBI double to center that brought home Matt Falvey to put Walpole back in front. Bryan Kraus and Chris McLean each followed with RBI doubles of their own to give Walpole a 10-7 lead heading into the bottom of the tenth. In the home half of the tenth, the Hornets got the leadoff man due to a fielding error, but Chamoun generated three consecutive outs to keep Walpole’s Super Eight run alive. Behind the plate, Page was terrific for the Rebels making the aforementioned game saving block as well as a catch along the backstop netting in the tenth for the second out of the inning. Mansfield starter Kevin Down and Donato matched each other nearly pitch for pitch through the first five innings, with both allowing just one run as the game turned to the sixth. The Rebels broke the 1-1 tie in the top of the sixth as Kraus doubled, McLean dropped an RBI triple into right field, and Jack Magane perfectly executed a suicide squeeze to put Walpole on top 3-1. Wapole created breathing room one inning later. Aiden Murray singled and Falvey tripled to left center to increase the lead to 4-1. Dylan Hanifin followed with an RBI double to right, and after a dropped fly ball and a hit by pitch, McLean lined a sacrifice fly to right center field to make it 6-1 Walpole. Brett Lavanchy capped off the frame with a single to left to put Walpole up 7-1. The Hornets got a run back in the bottom of the seventh on a base hit off the bat from Nugent that scored Saraceno. Donato, however, was in full control through the first eight innings allowing just one earned run on eight hits while walking one and striking out six. Throughout the night he showcased a willingness to pitch backwards, throwing his curveball for first pitch strikes before putting hitters away with his fastball. Donato was adamant on pitching the ninth inning. “I had command of everything,” said Donato. “Fastball, curveball, change I was mixing everything and then on the last out it changed. (Costello) was not going to take me out. I was not going to let him."